A.K.A., candy Mama doesn’t want me to know about. The Easter Bunny, apparently, left a partial bag of jelly beans in a cupboard. 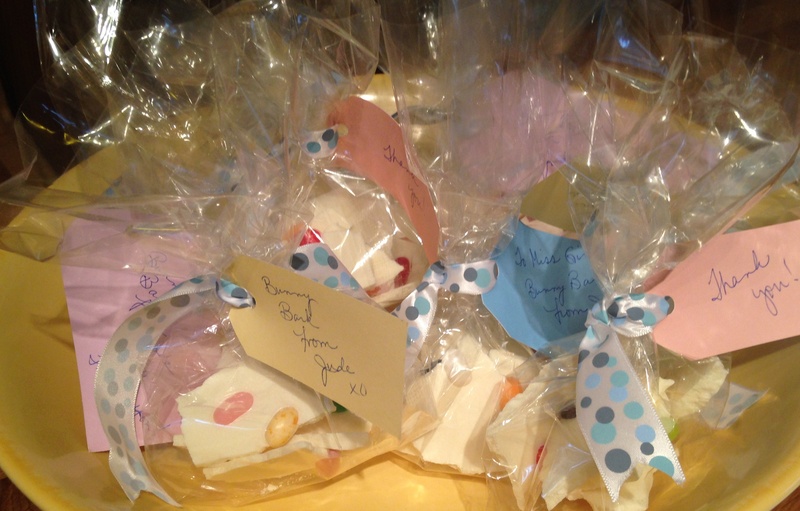 Mama decided the quickest way to get them out of the house was to make a treat for my teachers. We’re calling it Bunny Bark. Isn’t that funny? Bunnies don’t bark! It’s super simple to make. 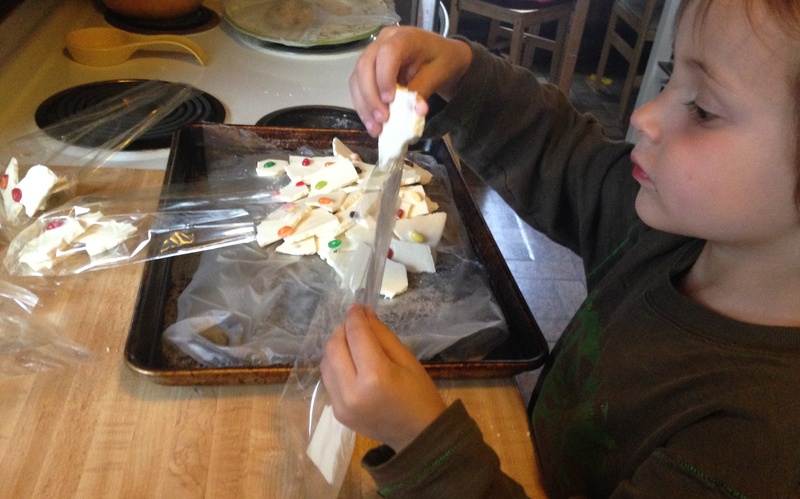 Mama melted white chocolate chips in something she called a double boiler then spread it out in a baking sheet. 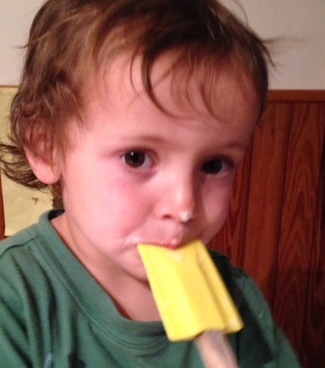 I got to lick the spatula. Isn’t that pretty? I had fun pointing out the matching ones. I counted the number of pieces in each bag so they were all the same. Not only is this a pretty gift, but it was fun to make (and yummy to eat). Melt the chocolate in the top of a double boiler (or in smaller batches in the microwave in 20-second intervals). To set up a double boiler, simmer water in a medium saucepan and set a bowl over it (not touching the water). Be careful when you stir the chocolate and remove the bowl, as steam can escape from the saucepan, and it’s hot! When the chips are nearly melted, remove the bowl of chocolate and continue stirring until fully melted. Pour the melted chocolate onto a jelly roll pan or baking sheet lined with waxed paper or parchment paper; our sheet is about 16” x 13”. Spread out the chocolate and then give the baking sheet a little shimmy or a tap to encourage the chocolate to smooth out. 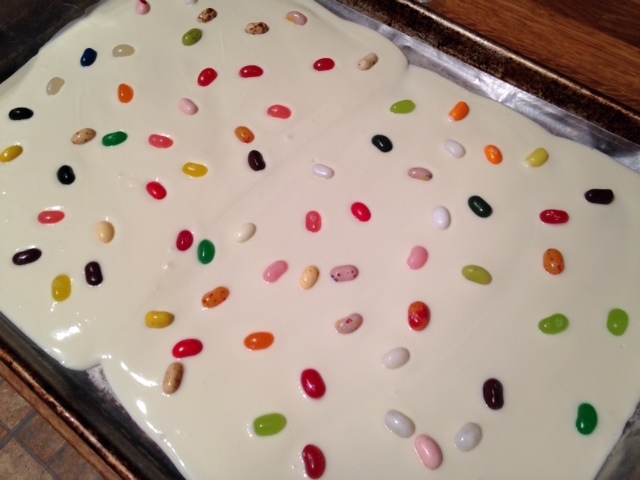 Allow to cool a couple minutes, then sprinkle jelly beans on top—in however dense a manner as desired. Note: This recipe may be halved. You can use milk or dark chocolate—or swirl white and brown chocolates together. 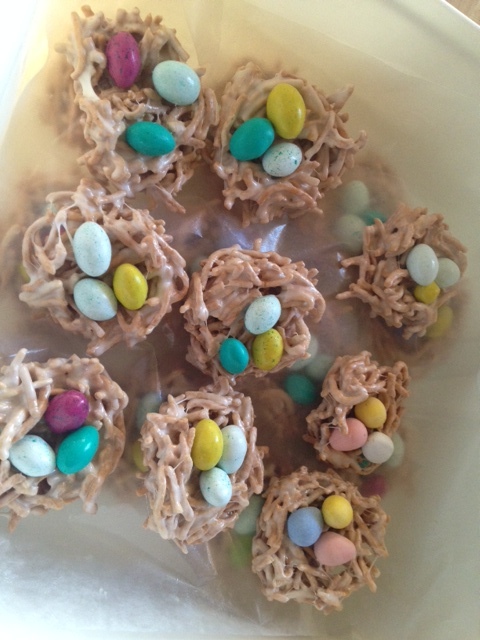 You may also substitute malted chocolate eggs in place of the jelly beans. 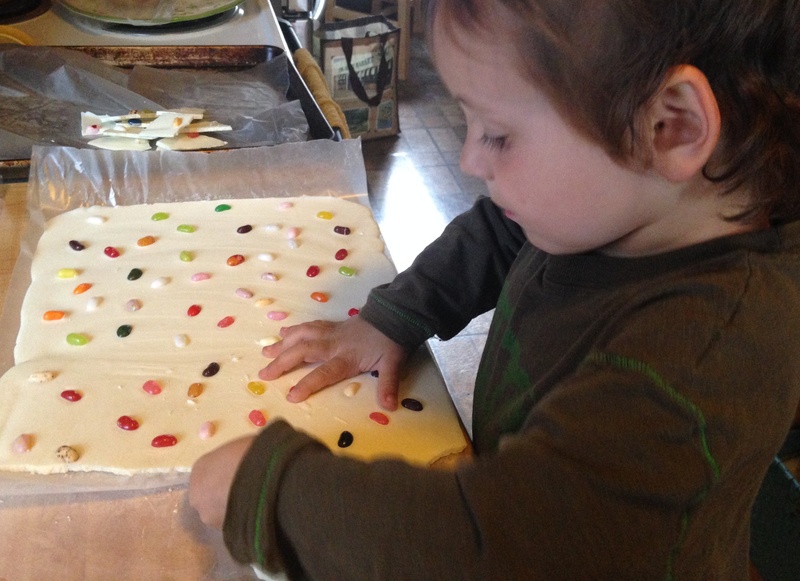 We used peanut butter M&Ms and malted eggs, but jelly beans would’ve worked too…if we had any left. Categories: Desserts, Hits, With recipe | Tags: baby food, Bunny Bark, chow mein noodles, cooking, cooking with toddlers, Easter candy, jelly beans, mini marshmallows, recipe, white chocolate | Permalink.